I love baking and making candy during the holidays. Homemade Holiday Food Gifts are a great way to show friends and family just how much they mean to you. Christmas Bark recipes are simple to make and there are so many amazing flavor combinations from Grown-Up Peppermint Bark with Sambuca to this easy Reindeer Christmas Bark Recipe. Christmas bark is one of the easiest homemade candies you can make during the holidays and a tasty dessert option to add to your Buffet Menu Ideas! 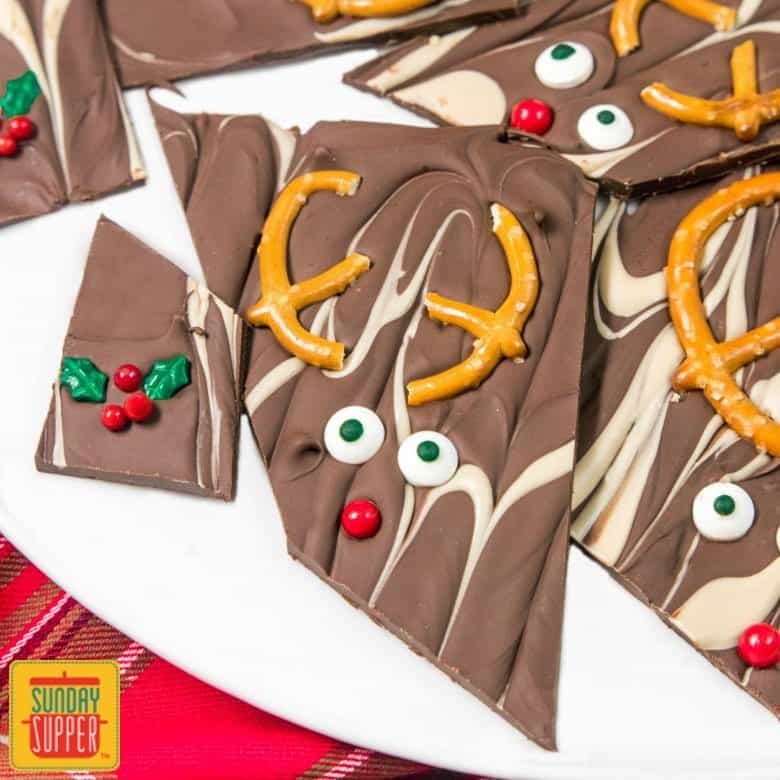 This Chocolate Caramel Reindeer Christmas Bark recipe isn’t only easy to make, it is super fun too! The kids love to help make this Christmas candy and there really isn’t any way to do it wrong, so I break out the candy eyeballs and let them go to town. The caramel portion of this Christmas bark recipe is actually caramel flavored chips, like chocolate chips but caramel. They melt great and firm up like chocolate so they are perfect for making bark. 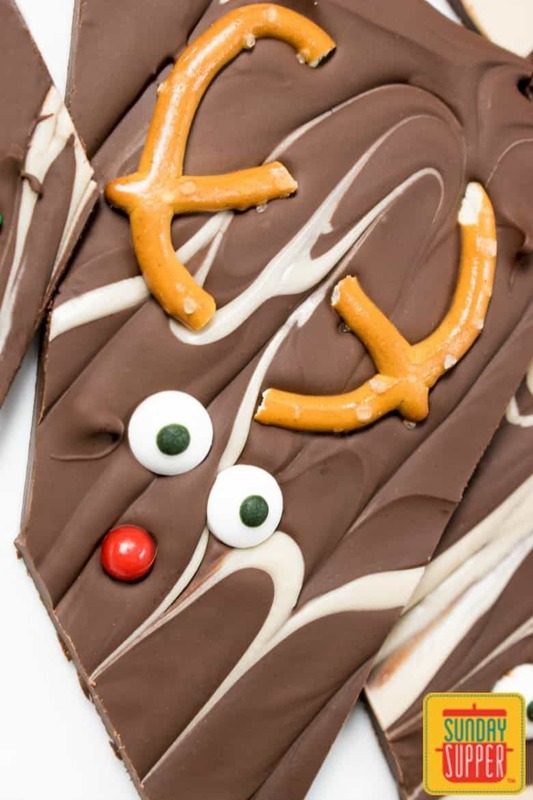 Our Chocolate Caramel Reindeer Christmas Bark recipe is all about that cute reindeer face and fun pretzel antlers. I went with two sizes of pretzels, mini and full size, just to break things up a bit. Also, so I could fit more reindeer faces on my bark. The pretzels are broken in half to create a set of antlers. You can use edible candy eyes, red ball sprinkles for a nose, and any other fun sprinkles you like. I found these awesome holly sprinkles at my local craft store and they added just the right touch of Christmas green! Melt your chocolate chips and your caramel chips in separate bowls. Spread the chocolate on a lined baking sheet and then drizzle the melted caramel chips over it. Drag a toothpick gently through the caramel line to swirl it with the chocolate. Break your pretzels in half and place them on the chocolate to create sets of antlers. Add 2 edible eyes and 1 red ball sprinkle to each set of antlers to create a reindeer face. Add any other holiday sprinkles or candy you’d like. Place in refrigerator for 1 hour to harden. Remove from fridge and break into irregular pieces. Box it up and give it to friends for the holidays! 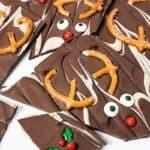 This Chocolate Caramel Reindeer Christmas Bark recipe can be packaged up with other homemade food gifts like Chocolate Caramel Pecan Bites, and beautiful Snow Globe Cookies to create a sweet Christmas gift made with love. Our easy Reindeer Christmas Bark Recipe is one of the easiest homemade candies you can make during the holidays and a tasty dessert option to add to your Buffet Menu Ideas! Place chopped milk chocolate in a microwave safe bowl and microwave 15 seconds at a time, stirring in between, until chocolate is melted and smooth. Place chopped caramel baking chips in a microwave safe bowl and microwave 15 seconds at a time, stirring in between, until chocolate is melted and smooth. Spread the milk chocolate on a parchment paper lined baking sheet. Keeping the chocolate about 1/8 inch thick. Pour the melted caramel baking chips in three straight lines across the milk chocolate layer. Drag a toothpick gently through the lines making swirls of caramel in the chocolate. Break the pretzels in half and place them slightly apart in pairs of two as antlers. Under each set of antlers place two candy eyes and 1 red ball sprinkle as a nose. Add any other holiday sprinkles you 'd like. Place in refrigerator to harden for at least 1 hour. Remove from fridge and lift chocolate from the parchment paper. Then break the chocolate apart into irregular pieces.